Niukawakami-Jinja-Kamisha Shrine enshrines a dragon. 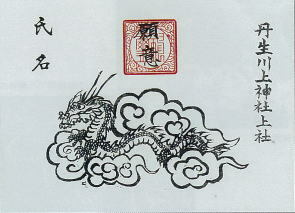 The name of this dragon is Takaokami-no-Okami. In Japan, a dragon is a god who controls water or rain. So Japanese worship a dragon because water is important to agriculture. Takaokami-no-Okami is a dragon who lives in the peak of the mountain, while there is another dragon in the bottom of valley. Its name is Kuraokami-no-Okami, enshrined in Niukawakami-Jinja-Shimosha Shrine. In Japan, a lot of shrines deify Takaokami-no-Okami. The place of Niukawakami has been sacred for a long time. In 675, a shrine was established for controling rain. After that, the Imperial Court had commended the shrine. If people prayed for rain, they presented a black horse as a tribute. If they prayed for it to stop raining, they presented a white horse. In 897, the shrine was conferred a high court rank. But after 1467, when a big war took place in Kyoto, the shrine declined and people became unable to know where the shrine is. After 1874, three shrines have been thought to be that shrine. One of them is Niukawakami-Jinja-Kamisha Shrine. Before 1959, Niukawakami-Jinja-Kamisha Shrine was located on a lower place than the present position. We have moved the shrine because there was a dam build. Through archeological research conducted while moving the shrine, we discovered that the shrine had been a ceremonial place and people had enshrined gods here for a long time. These archeological finds are important in understanding the history of this ancient Niukawakami-Jinja-Kamisha Shrine.